Reporting on the significance of Bill de Blasio becoming mayor of New York may have led some to fear that the Soviet Union was being reincarnated in the country's largest city. While De Blasio is certainly to the left of many leaders of the America's Democratic party, he is certainly no radical seeking to overthrow capitalism. Furthermore, even if he did plan to seize the means of production, his ability to do so as the mayor of a major city would be quite limited. Nonetheless, there are many areas where the mayor of New York can have a substantial impact. The top of this list would be education policy. 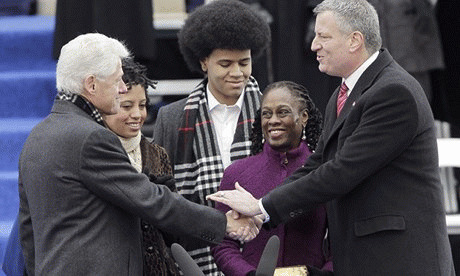 De Blasio's predecessor, Michael Bloomberg, was a vocal and visible supporter of the education reform movement. While this movement has produced big profits for corporations in the testing business and made some policy entrepreneurs rich and famous, it has not done much to improve education for inner-city kids. De Blasio's pick for schools chancellor, Carmen Farina, has decades of experience in the New York school system as a teacher, principal, and administrator. She apparently intends to scale back the intense focus on testing of the Bloomberg administration. She is also likely to work more cooperatively with the teachers union. If this path produces positive results, it will be an important example for other school districts. There are other areas where de Blasio could try innovative policies. The fact that a bloated financial sector can be a drag on growth (pdf) is getting increasing attention. Even the International Monetary Fund has advocated higher taxes on the financial industry (pdf) to reduce the amount of waste in the sector. Ideally, the United States would impose a tax on financial transactions similar to the one now being debated in the euro zone. While the city could not impose a large tax on the industry for fear of driving away business, certainly a very modest tax -- say 0.01% would be doable. Goldman Sachs and JP Morgan will not pick up stakes and move across the river over a tax of one hundredth of a percent. A tax of this size could raise billions of dollars a year. In the same vein, the city could impose a tax on the flipping of mortgages attached to property in the city. This tax would apply regardless of where the transaction took place. A tax of 0.15% on a mortgage sale would be a trivial cost for most homebuyers (a first sale could be exempted), but it would provide a substantial disincentive to repeated turnover. The city could also move to discourage real estate speculation by imposing a tax on vacant property. This one has the great effect that the best way to evade the tax is to rent or sell property that had been sitting empty. De Blasio could also try some useful experiments in making the workplace more family friendly. The City Council recently voted to require most employers to provide at least five paid sick days to workers. This rule is being phased in over the next two years. De Blasio could look to experiment with more flexible work schedules with the city's labor force. For example, if many workers opted for four-day workweeks, it would substantially reduce the time and money wasted in commuting. If four-day workweeks ever became the norm, it would mean a huge reduction in the amount of traffic and congestion during rush hours. De Blasio could also look to promote a work sharing program that is already part of New York state's unemployment insurance system. Under this program, employers have the option to reduce workers' hours rather than lay them off. Rather than getting unemployment benefits for losing their jobs, workers would have roughly half of their lost income reimbursed from the unemployment insurance system. This keeps workers on the job and improving their skills rather than risk being unemployed for a long period of time. Germany's effective use of work sharing and comparable programs have brought its unemployment rate down to 5.2% from 7.8% at start of the downturn, in spite of the fact that its growth rate is virtually the same as the US rate. Work sharing should be popular with the state government also since the cost of the program is picked up by the federal government, at least through the end of 2014. There are many other areas where de Blasio could be an innovator. He could try experiments with free transit on the buses and the subway to see how much ridership would increase and greenhouse gas emissions would be reduced. He could also look to have modest subsidies for retrofitting homes and businesses to make them more energy efficient. This would also be a great way to help generate employment. There are certainly limits to what a big city mayor can do, but Mayor de Blasio can make a difference for both the people of New York and the country, if he is willing to try.